Pop, Bang, Tick, Sizzle? What sound is your water heater making? The type of noise your water heater is making can help us diagnose the problem. My water heater is making a popping noise! We live on a big beautiful island where rain flows down mountains and then travels underground. In fact, according to the Hawaii Business Magazin, “On average, an estimated 1.8 billion gallons of rain per day fall on Oahu.” A third of that water recharges our aquifer by flowing through the porous lava rock that acts like a sponge. The water doesn’t just sit there, it moves around until it flows into the sea or into our streams and homes. Because our water is taken from Oahu’s groundwater it is no surprise that many Oahu homes have hard water. You have probably noticed little spots left on glasses and dishes—yup, hard water. Have you ever considered that similar spots collect inside your water heater, on the heating elements? It’s true. When minerals build up on the heating element they flake off and collects on the bottom of the tank as sediment. When the water gets hot it bubbles up through the sediment and causes the popping noise. Drain and flush your water heater. First turn off the electric and/or gas supply to the water heater. Next, connect a hose to the drain valve at the bottom of the heater. You will want to drain the water into the closest floor drain or outside the home. Close the shut off valve at the cold-water inlet line that supplies the water heater with water, and to relieve pressure inside the tank, turn on the hot water at a faucet somewhere in the house (like the kitchen sink). Next, using a screwdriver, open the drain valve at the bottom of the tank. NOTE: The water coming out of the hose will bevery hot and could cause severe burns. Make sure no one comes in contact with the water. Once the water has drained you can use the screw driver to close the drain valve at the bottom of the tank. Next open the shut off valve to allow cold water to fill the tank. When a steady stream of water is coming from the faucet you left open, you can close the faucet. Lastly, turn on the electric and/or gas. Have a water softener installed. Water softeners remove the minerals from the water and therefore will prevent sediment from building up in the tank. Oahu has hard water, but nothing like the continental United States. In fact, Oahu is known for having some of the freshest water in the world! Still, if you are hearing a popping noise coming from the water heater it is a clear indication that sediment is building up in the tank. You will want to address the problem as sediment can cause the heating elements to overhead and break. Your water heater in probably not making a banging noise, instead your pipes are making a banging noise. This is known as a water hammer, and usually occurs because the water pressure in your home is too high, or because the air cushion (a device in the plumbing lines designed to manage pressure) is waterlogged. You will want to address this issue by either having a Pressure Relief Valve (PRV) installed on the main line where the water enters the house, or by fixing the air cushion. To fix the air cushion you would need to turn off the water supply to house, and then drain the entire plumbing system. This would allow the air cushion to fill back up. 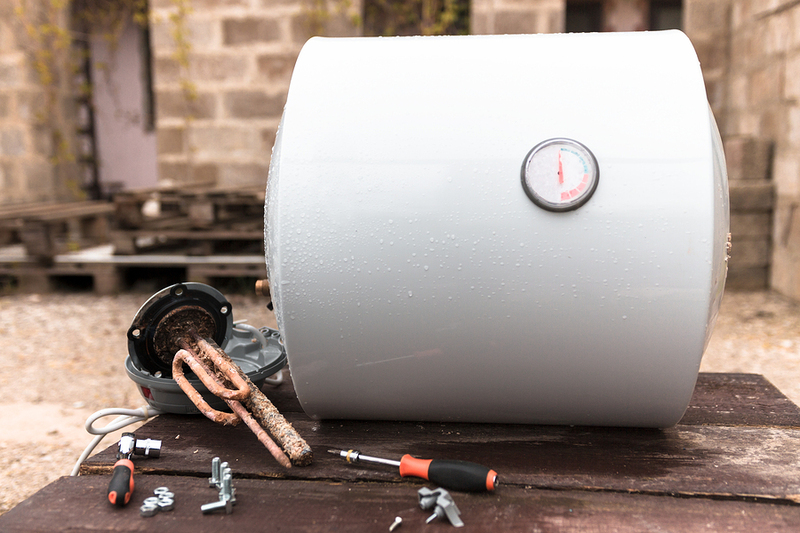 Your water heater is probably not making a ticking noise. Instead, just like the water hammer, the fluctuation in water pressure could be causing the ticking noise. It could also be that the hot water pipes are slightly banging against loose pipe straps designed to hold them in place. In addition to ticking, this sound can also sound like a humming or vibrating. To fix this problem, simply tighten the pipe straps or add plastic spacers between the pipe and the strap. A sizzling sound could indicate condensation building up on the bottom of the water heater, or a leak. How can you tell the difference? If the sizzling sound is continuous, then you might have a leak. Water is dripping from the tank onto the hot burner plate and then you here that “tzssssss.” If this problem only occurs when the burner is on, then it might just be condensation. Also, if you had a leak, you would notice that the bottom of the water heater was wet. Whether it is sediment building up on the bottom of the tank, too much pressure in the system, or a leak, all of these issues need attention and have a solution. Your hot water heater is a major appliance in your home that takes care of you. Giving your hot water heater a little attention and TLC will go a long way. If your water heater is trying to tell you something (pop, bang, tick, sizzle), and you would like a pair of expert ears to take a listen, give Emergency Plumbing and Solar a call today! We can show your water heater the TLC it needs, and get things nice and quiet again. Why Water Heater Making Noise and Solutions Overall rating: 5 out of 5 based on 10 reviews.